Bangalore: Love and peace was the message of prophet Muhammad’s (pbuh) life. There were hundreds of aspects of his personality and he was successful in all walks of life. 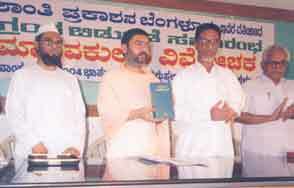 He was a great leader, administrator, teacher and benefactor said Shri Veerabhadra Channamalla Mahaswamigalu, president, Nidumamidi Math after releasing a book on prophet Muhammad’s life Maandva Kulada Vimochaka (the benefactor of humanity) in Kannada at a function organised by the Shanti Prakashana at the COS Hall. Swamy Channamalla highlighting the kindness of the prophet (pbuh) said that there are a number of examples to show that the prophet loved his religion, Allah, even his enemies and the whole humanity at large. He said that Hudaibiya Treaty reflected the peace loving nature of the prophet Muhammad. He fought against hatred and enmity and established an ideal society. He added that prophet Muhammad’s (PBUH) life is an ideal life for the whole humanity, and the Holy Qur’an revealed upon him by Allah has the solution to all the problems of human beings for all the times. Janab Ibrahim Sayeed, president, Jamat-e-Islami Hind, Karnataka and Goa zone, who rendered the translation of the book, said in his presidential address that prophet Muhammad was sent as a benefactor of humanity by God. The prophet (pbuh) was the greatest human rights advocate and he uplifted the status of women. His teachings reflect the solution to all problems. The dress code advocated by him was modest. The equality and social justice proposed by him has no parallels. Prophet was a model for the mankind, Sayeed said. Maulana Usman baig Rashadi reminded the Muslim community that it is their duty to spread the massage of Islam in every language to the whole of humanity. Professor G.S. Siddalingayya, former president, Kannada Sahitya Parishad highlighted the authentic and micro-detailed narration of all the incidents of the life of prophet Muhammad in the book released. He also released a cassette of songs ‘wake-up the reckoning is nearer’ produced by Students Islamic Organisation of India (SIO), Karnataka zone.